← Le Boss needs your photoshop skills! New extension… WITH ANIMATED PICTURES! Mohamed Mahmoud made a new extension using some of the source-code from the old extension by Lé Boss, and this extension by anonymous86. This extension is the first one to have ANIMATED pictures! This entry was posted in Chat Codes and tagged animated, anonymous86, chat, chrome, code, codes, emoticons, extension, facebook, firefox, gif, google, google chrome, greasemonkey, Le Boss, Mohamed Mahmoud, pictures, small, smiley, smileys, smileyti.me, source, sourcecode, techez, turboelgo, turbolego, turbolego.com/L.txt, userscripts, You Mad. Bookmark the permalink. 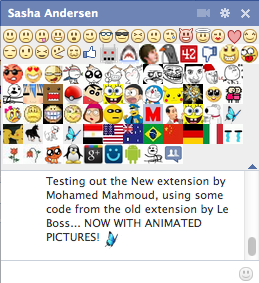 2 Responses to New extension… WITH ANIMATED PICTURES!